A tooth pick-knitted fob – Craft-a-licious . .
It’s a lovely spot, very touristy. Yesterday we stopped at Port Gregory, where I put the finishing touches to my fob in front of this view. Yes, I’m living the charmed life! Just a couple of kilometres away was this fabulous pink lake with birds pecking along its shores. I often wear a little fob which is in the shape of a robot. Sadly, with age, my eyesight is not what it was. So, after accidentally cracking its face I thought it was about time to get a watch that was easier to see. Target came through with the goods of a $3 watch, and I thought ‘one day, when I’m sick of squinting, I’ll get around to making this into my new fob watch’. So, 3 years later I decided last week to do it as an ‘inbetweener’ project. You know, those little ones you do in between or alongside those big ones. Procrastination is, unfortunately, my strong point. Needless to say the battery has run out and the closest battery shop is about 200 kms away. Bugger. Shall have to squint a little while longer. I thought it would be a quick, easy, couple of hours’ project at best. It turned into a 5 day marathon. 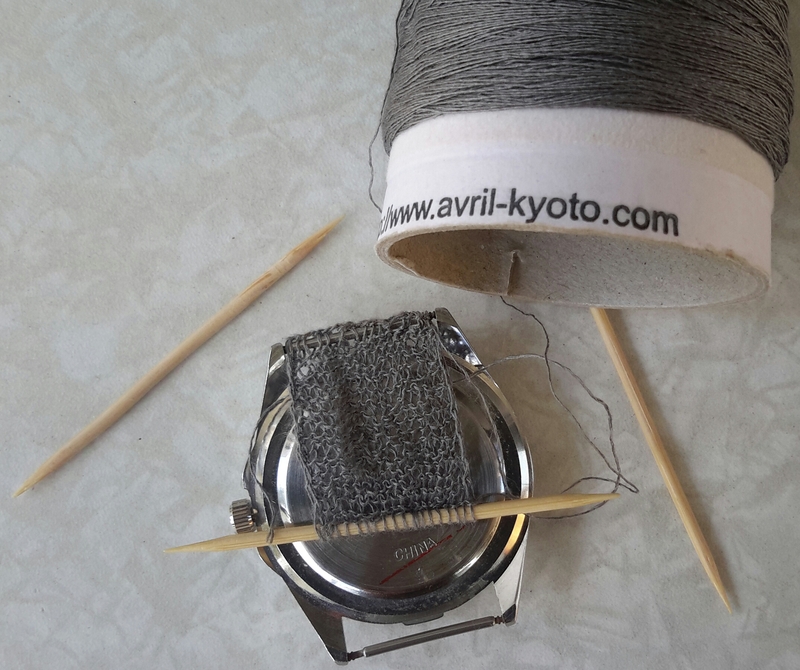 4 times I frogged those stitches [knitting slang for ‘undo’ – I promise I didn’t make up that term]. But I carried on. Knitting on toothpicks is quite easy once you get used to it – but best done in sunlight whilst wearing strong magnifying glasses. Besides if you break one needle, there’s 198 more close to your (multiple pricked) fingertips. Safety tip: ensure sunlight does not pinpoint through glasses and ignite your project. Before leaving Melbourne I picked up some fabulous yarn from Dairing, as they stock some really interesting, quirky sorts – mainly Japanese. 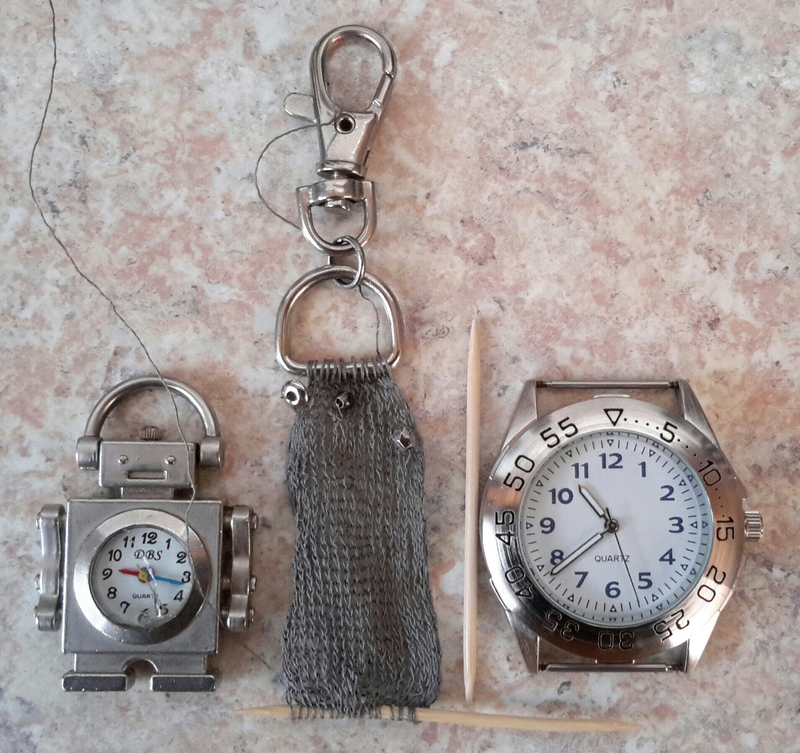 The one I used for my fob was silk wrapped stainless steel – a fine yarn and, as I knitted in stocking stitch, I could flatten out the sides to prevent it rolling back on itself (because of the metal). Sadly, I had to apply some super glue to the stitches on the fob’s D ring as they tended to bunch up in one corner, wrecking my symmetry. I reckon as soon as I get a battery for it – I’ll be looken pretty cool whilst wearing it! … even though there’s only 12mm of (fabulous!) knitting showing on my (rather large) left hip. Aaahhhh, but the satisfaction of actually finishing something that will (soon) be useful is sweeeettt!! With many best wishes for finishing your projects before the end of the year; or if not, there’s always next year ..
what a lovely little thing cath and what a diligent lil worker u are. that yarn is amaze! Thanks kindly for liking it Trishy. 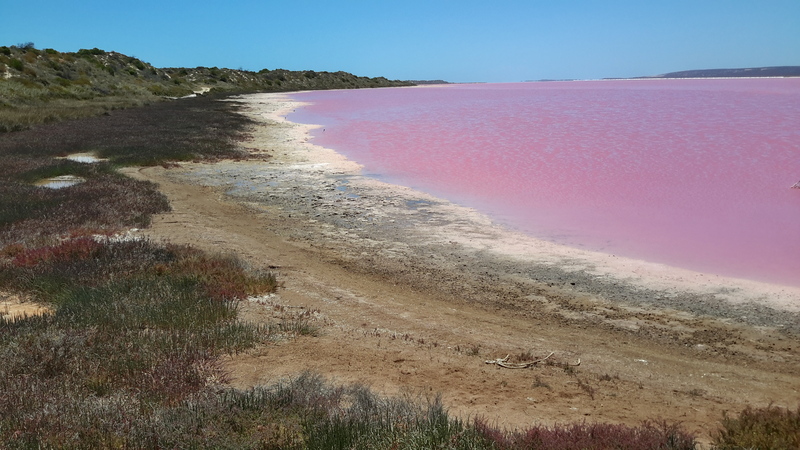 The lake is pink due to a specific algae (apparently also used in food colouring) trapped in the salt crystals. I suppose you could swim in it – there was a heavily salt encrusted branch in the water, so am thinking a heavy Catherine would probably be quite buoyant also! Hope you guys are also well and happy on the Eastern coastline.